Phacoemulsification is the most modern technique. With this procedure the opaque lens is extracted through an incision of only 2-3 mm, with less trauma and faster recovery of vision. After operating with phacoemulsification, a foldable intraocular lens may be placed. In cases where the retina is normal and there are no other pathologies, we can implant a multifocal intraocular lens. This will allow the patient to see far and near without the use of eyeglasses. 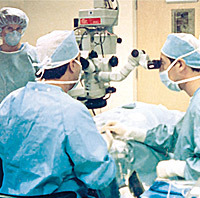 Phacoemulsification is the most modern technique for the extraction of cataracts. The crystalline lens is located behind the pupil and iris and in front of the vitreous. This lens is a fundamental element for refraction and is involved in the process of accommodation. With age, the lens may get thicker, leading to changes in refraction. Usually, in people older than 65 years, the lens may start becoming opaque (loses transparency), this process is called cataract. The most common cataract is the senile, but there are also post-traumatic, associated with diabetes, juvenile and congenital cataracts. In most cases, the treatment of cataracts is surgical. This is an ambulatory procedure, which takes between 30 to 40 minutes. It involves removing the cataract through a small incision in the front of the eye and removing it with an intraocular lens, which is placed on the posterior capsule. The prognosis of patients operated for cataract intraocular lens implant is good, although the final vision will depend on the functional state of the retina.